From Holmes County, OH, we headed back south toward Myrtle Beach. We had planned to explore another area of South Carolina before going to Myrtle Beach, but we needed to stop again in Charlotte on our way through. We are really getting a lot of practice being flexible. Paul is very conscientious about checking tires and tire pressures. A blowout on a 24,000 pound motor home at highway speeds can be a real disaster, and that is something we want to avoid. This spring, Paul noticed some small cracks in the rubber on the sidewalls of the front tires. 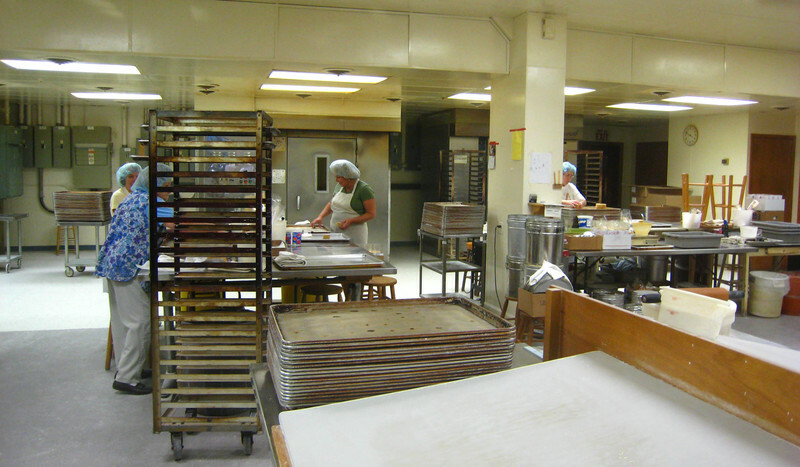 Exposure to UV light (sunlight) and pollutants in the air will eventually cause aging and deterioration of rubber. There are additives in the rubber to prevent this, but all tires will eventually deteriorate. Most car tires will wear out before this happens; but cracking is more common on RVs since they are usually driven less. Even though our tires are less than four years old, the rubber in the front tires seemed to be aging prematurely. Since the tire manufacturer warrants the tires against defects such as premature deterioration for five years, Paul called Michelin while we were staying near Charlotte before the NASCAR race. As expected, Michelin wanted us to take the motor home to a truck tire dealer in Charlotte to have the tires inspected. Michelin sent us to TCI Tire Centers, which is a nationwide chain that specializes in truck and commercial tires. 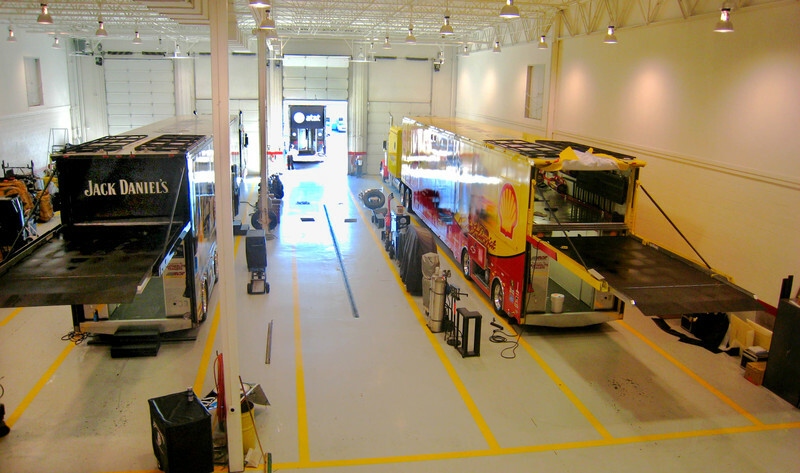 Some of their tire centers also sell automotive and light truck tires. We stopped by on our way from Ebenezer Park to stay at Yates Family Camping for the race a few weeks ago. The service manager at TCI said, although the tires were still safe, they should not have cracked that soon and that Michelin would definitely make a warranty adjustment (the price of new tires would be prorated according to the amount of tread left on the old tires). Unfortunately, they did not have the RV tires in stock. When Paul called before we stopped by, they said they could get the tires the same day if they didn't have them. However, we found out once we got there it would take at least 5 business days to get the tires in because RV tires came from a different warehouse. We knew we would have time to stop in Charlotte again on our way back from Pittsburgh to Myrtle Beach, so we told them to go ahead and order the tires. On our way back south after leaving Holmes County, OH, we decided to stop again at Fort Chiswell RV Park in Max Meadows, VA, where we stopped on our way north. 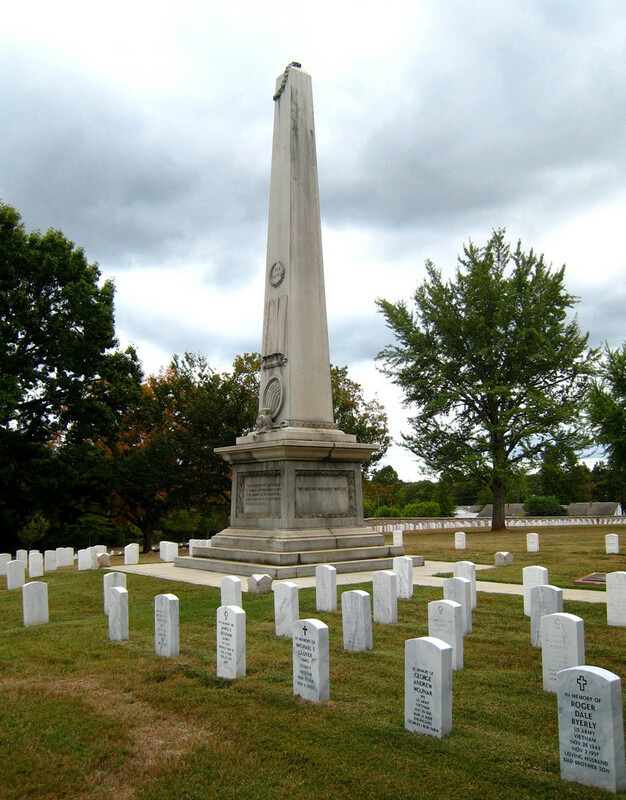 The photo below shows the site we had at Fort Chiswell on the way back to Charlotte. Fort Chiswell RV Park seems to be uniquely positioned as an overnight stop. Every day we were there, the campground would empty out in the morning, then begin to refill around 1:00 PM. During the peak arrival time between 3:00 and 5:00 PM, there would frequently be up to 3 rigs in line waiting to check in. As soon as one would finish checking in and move to their campsite, another rig would pull in from the road and join the end of the line. The campground is conveniently located about a half a mile from the interstate exit where I-77 and I-81 intersect. 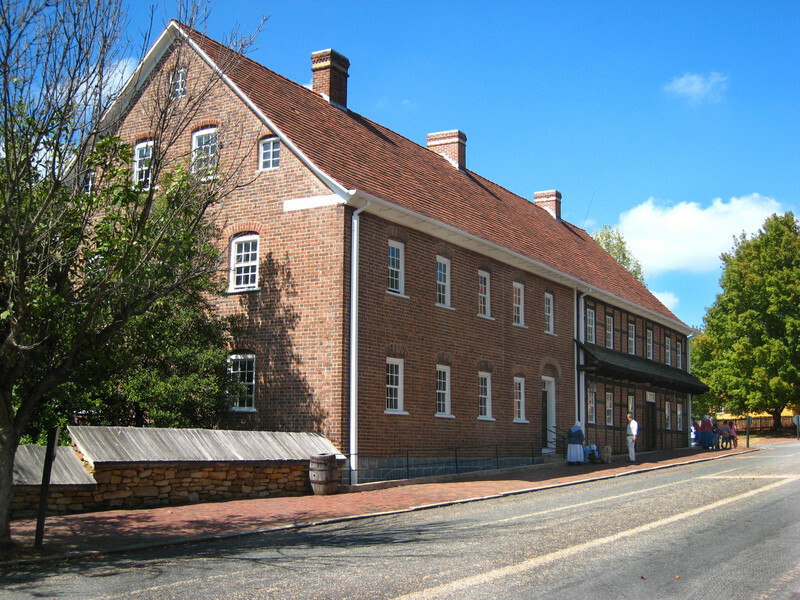 The pull-through sites at Fort Chiswell are also a plus for one-night stops. 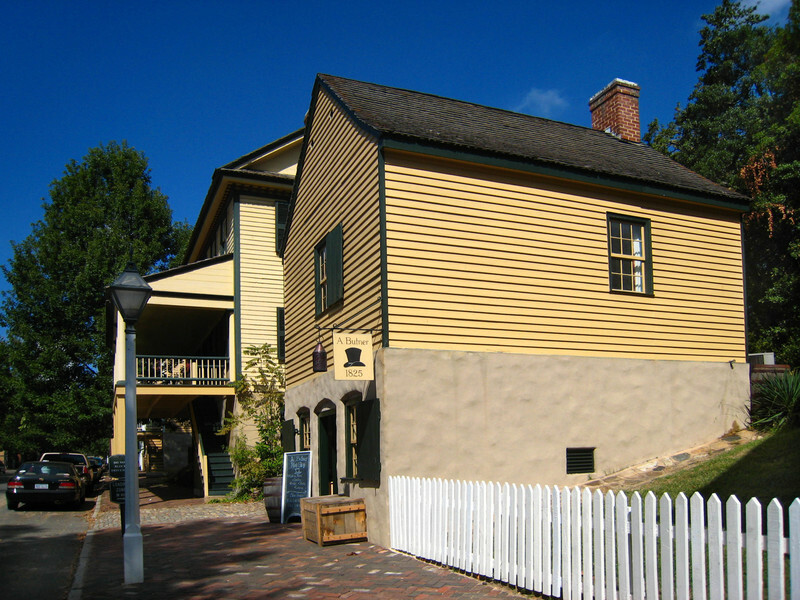 The plan was to stay at Fort Chiswell and relax for the weekend and then travel the rest of the way to Ebenezer Park in Rock Hill, SC, where we stayed before the race. Because Ebenezer Park doesn't accept reservations and since the locals use tents to save sites for themselves and their friends, it seemed hard to get a good site. Therefore, we thought it would be best to arrive early in the day on a Monday. When we got to Ebenezer, there was hardly any site available, much less one where we could get our satellite dish to work. As we said, the locals have it pretty well locked up. So it was on to Plan B. Up the interstate a couple of exits was a KOA where we figured we could surely get a site. The good news was the KOA is closer to the tire dealer, but the bad news was it is considerably more expensive than Ebenezer. They did have sites available, and it looked like we could have found several where we would have had a clear view of the southern sky for satellite. However, they told us to stay away from the far right corner of the campground because that's where their haunted house was and it could be noisy until 11:30 PM or so. We're not fond of Halloween in the first place and we really didn't want to take a chance on crowds and noise, so we told them, "Thanks, but no thanks," and went on to Plan C.
Up the highway one more exit (and even closer to the tire dealer) was Carowinds Amusement Park, and they have a campground. The amusement park is only open during weekends in the fall, but Carowinds Camp Wilderness Resort is open year-round. The prices at Carowinds Resort are similar to the KOA in-season but their off-season rates were more reasonable at $30/night. With the park being closed during the week, the campground promised to be a lot quieter (except for being under the flight path for nearby Charlotte Airport). Since the campground was fairly empty when we arrived, we didn't have any problem finding a site that was good for satellite reception even though there are quite a few trees. Camp Wilderness has some of the most spacious sites we've ever seen in a private campground. The sites are as big as in many state parks. Although the campground roads are a little narrow, they are paved as are the pads. There are full hookups and free Wi-Fi. The photo below shows our site at Carowinds Camp Wilderness Resort. As it turned out, the tire warehouse didn't have the RV tires in stock either and had to order them directly from Michelin. Instead of taking 5 business days to come in, the tires took almost three weeks. But the tire dealer called and assured us the tires would ship to arrive in time to be mounted before we had to leave for our reservations in Myrtle Beach. While waiting for the tires to arrive, we decided to take a drive up I-77 to nearby Mooresville, NC, which calls itself Race City USA, to see the North Carolina Auto Racing Hall of Fame. 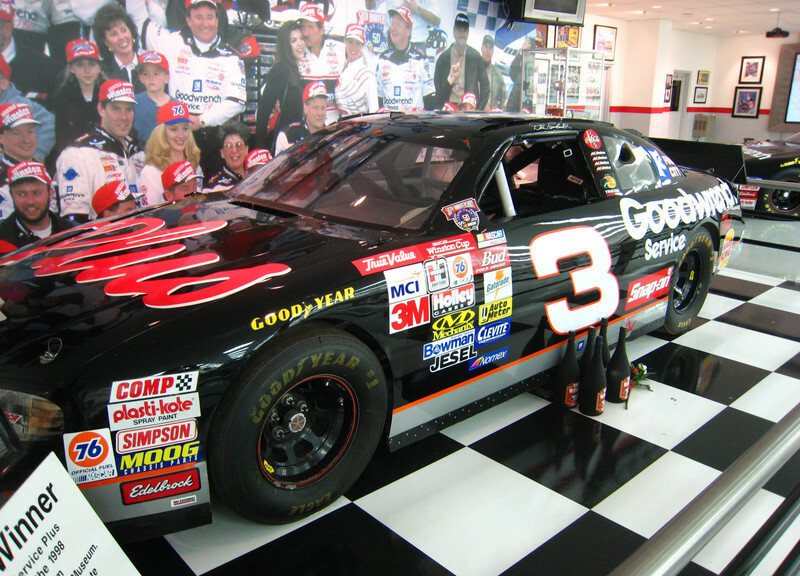 The NC Auto Racing Hall of Fame has items on display from other forms of racing, but they concentrate on the history of stock car racing since they are in the heart of stock car racing country. Stock car racing has its roots in bootlegging during Prohibition. Cars would be modified to carry moonshine and to improve performance to outrun police. From the outside, they would look like regular cars so they wouldn't attract attention. When Prohibition ended in 1933, many Southerners still had a taste for moonshine. Drivers continued to deliver moonshine, and they continued to modify their cars to escape the "revenuers" who wanted to tax their product. The photo below shows how a car was modified to carry 'shine. By the early 1940s, drivers were racing their cars for bragging rights and for profit. The stock cars were regular street vehicles that were lightened, reinforced, and whose engines had been modified for more power and speed. Stock car racing was great entertainment in the South. Bill France, Sr., who was an auto mechanic, got the idea that more people might enjoy watching stock car racing; but he realized that to become popular, the sport would need more organization, uniform rules, and a more regular schedule. France met with other influential racers to discuss organizing stock car racing, and on Feb. 21, 1948, NASCAR (National Association for Stock Car Racing) was born. 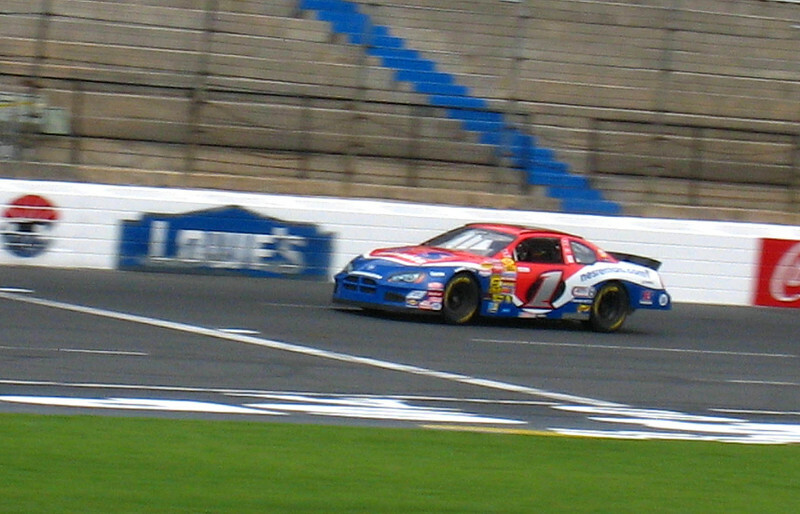 Today, NASCAR racing is the second most popular spectator sport in the U.S. after NFL football. The NC Auto Racing Hall of Fame has some very interesting displays of racing memorabilia, racing art, driver profiles, and cars. 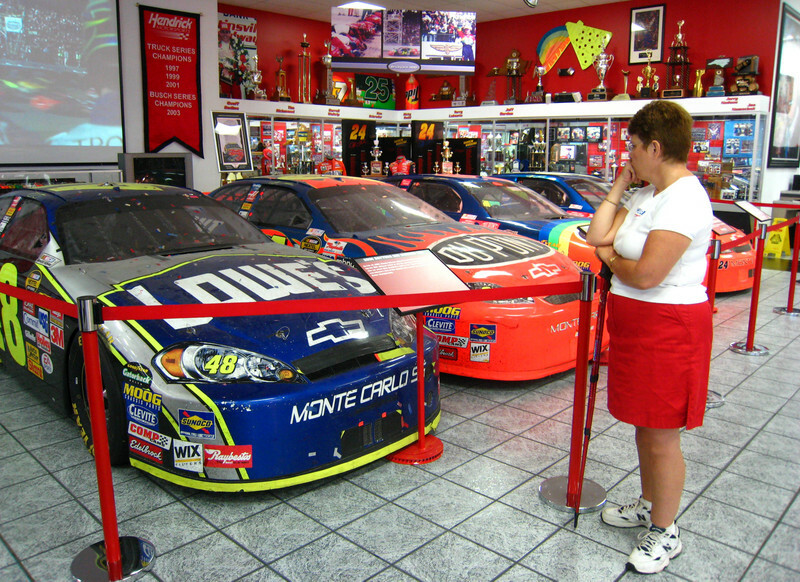 In the photo below, Margery is looking at some of the older stock cars on display. Today's stock cars are specially built for racing from the ground up and bear only a slight resemblance to anything available in a new car showroom. In the old days, regular production vehicles were stripped, reinforced, and modified for racing. From the Racing Hall of Fame, we drove about 20 minutes farther west to find the Bird Brain Ostrich Ranch. The ranch showed up on a search of things to do on the internet, and we wanted to check it out because they supposedly had tours. We were also curious about the ostrich meat available for sale. Unfortunately, their "season" must be over because when we got there, there didn't seem to be anyone around. We did walk behind the house to take a quick look at the ostriches, though. After the ostrich ranch, we drove to the quaint downtown business district of Mooresville where we stopped at D. E. Turner Hardware. Although there are lots of nostalgic items on display, they also sell many of the things you expect to see in any modern hardware. 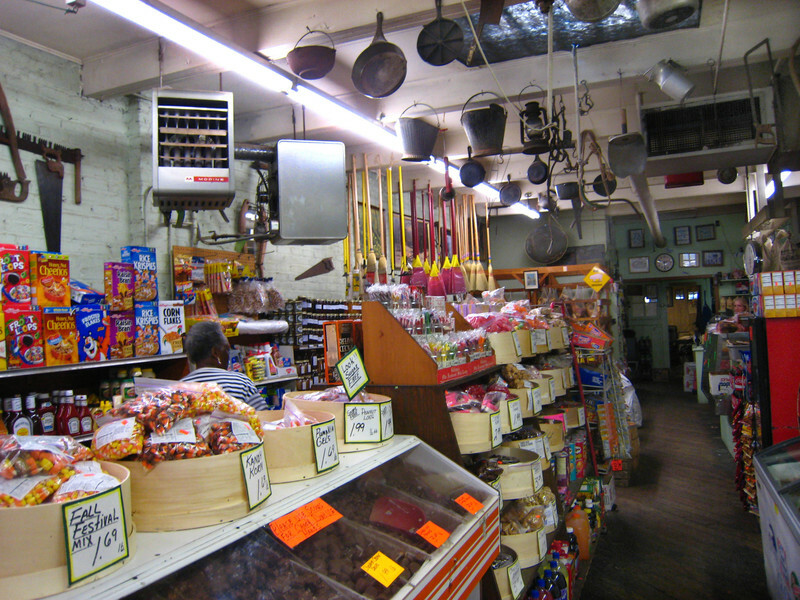 The store itself has never been remodeled and looks pretty much the way it did when it first opened in 1899. Margery is checking out some of the merchandise at the hardware. We finally got a call that our tires were in so we got up early in the morning of our last scheduled day in the Charlotte area and drove 17 miles into town to the TCI Tire Center. We got right into a service bay and they immediately began removing the front wheels. The guys here really work hard wrestling the big truck tires around and muscling them off and back onto the rims. They obviously have had a lot or practice because they actually make it look easy. A swing with a sledge to break the bead free from the rim and a couple of pulls on the over-sized tire iron and the tire was off. A couple of more pulls on the tire iron and the new tire was on. In about an hour, we were on our way back to Carowinds Resort. Paul thought the price of the tires at TCI was very reasonable. In addition, we got a discount from the already excellent price as a warranty adjustment based on the amount of tread remaining on the old tires. If you're in the market for tires for your RV, pickup, medium duty truck, or heavy duty truck, check out TCI Tire Centers. Because they specialize in commercial tires, call ahead to make sure they have or can get the tires you need. We don't know if the prices are as good at all their locations, but we thought the prices were great at their Charlotte tire center. All the people there were also very friendly and helpful. We got set up again back at Carowinds and we puttered around the rest of the day and got ready to take off for Myrtle Beach in the morning. We spent a little over a week at Ebenezer Park just south of Charlotte in South Carolina until Friday before the Bank of America 500 NASCAR race at Lowe's Motor Speedway. As we said, we would be meeting our daughter, Lora, our son in law, J. Michael, and their friends, Jon and Kathy, for the race. While the others would be staying at a motel, we found a small campground within sight of the track where we could stay the night before and the night after the race. On Friday before the race, we drove about an hour from Ebenezer to Yates Family Camping, which is located behind Lowe's Motor Speedway just north of Charlotte in Concord, NC. We thought the price at Yates Family Camping was extremely reasonable at $30 a night for a non-electric site (with water only) considering the convenient location and close proximity to the track. Many other campgrounds cost $75-150 per night on race weekends. The photo below shows our site at Yates Family Camping. Yates Family Camping has about 40 sites and about 10 to 15 of them have electricity. We didn't call soon enough to get an electric site, but we figured we would be just fine with our on-board generator, especially since the weather was cooling off to the 70s and we wouldn't need air conditioning. For those staying a little longer or with extra people in their RV, the Porta-John truck drove through the campground every day in case you needed to empty your holding tanks. As you can see in the photo above, the campground had tight quarters with side-by-side and back-to-back hookups. And, of course, a race weekend is a party weekend. Everyone had flags with their favorite driver's number as well as their grills, chairs, coolers, radios and TVs set up outside. But Yates calls itself a family campground; and, although everyone had a good time, the crowd was by no means unruly. The photo below was taken in the morning, but you can see some of the set-ups as a few folks are beginning to gather at the site to the rear for breakfast. The most noise at the campground was made by the inexpensive, portable, contractor-type generators. These are the kind sold by home improvement stores and and designed for construction site use, not the close quarters of camping. 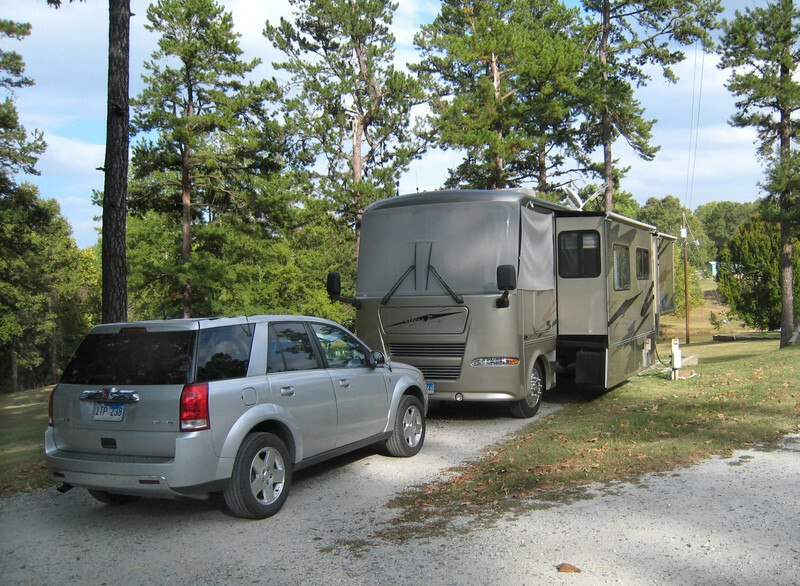 On-board RV generators are usually fairly quiet and sound like a car running at a fast idle. Honda also makes a series of very quiet, portable generators, but they cost more than twice as much as a contractor-type generator. Unlike the contractor-type generators, the Hondas also provide very clean alternating current power suitable for electronic equipment like TVs, computers, and microwaves. By Friday afternoon, Lora, J. Michael, and their friends arrived. 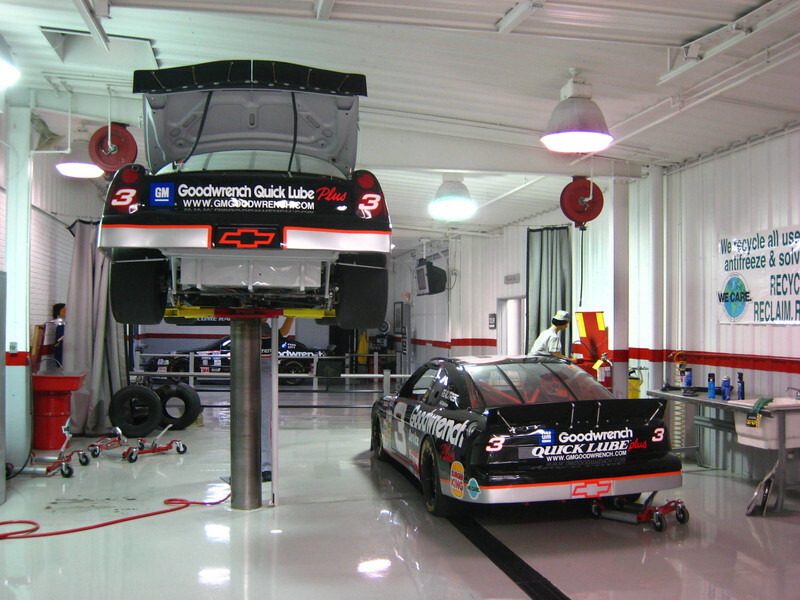 After they checked into their motel, we met them at the race shop of Roush Fenway Racing. 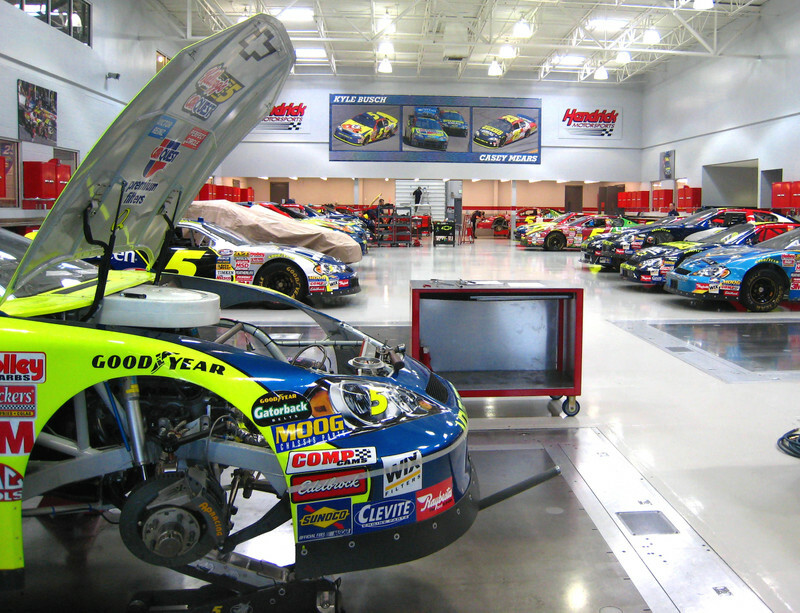 Last year, we visited the shops of Hendrick Motor Sports and Richard Childress Racing, so we were eager to go to a shop that we had not visited before. Roush Fenway is the home of Sprint Cup Series drivers Carl Edwards (#99), Greg Biffle (#16), Matt Kenseth (#17), Jamie McMurray (#26), and David Ragan (#6). Of these drivers, Carl Edwards, Greg Biffle, and Matt Kenseth are currently in the running for this year's championship. The photo below shows some of the cars belonging to driver David Regan. In addition to being able to view part of the garage area (unfortunately, we got there after quitting time, which is noon on the Friday before a race), there was also a museum touting the wins and accomplishments of the team's drivers. The photo below shows our group in front of one of the cars from the recent past on display in the museum. Afterward, the girls wanted to stroll around the nearby shopping mall. Meanwhile, the guys went to Bass Pro Shops/Outdoor World. We met up again at On the Border Mexican Grill and Cantina for dinner. The hot corn chips and salsa started coming from the moment we sat down. We got a "pick 3 - make your own" platter where we both chose beef empanadas, a chile relleno, and a fish taco. It was the first time either of us had had a fish taco. We had a hard time getting used to the idea of fish in a taco, but everyone said they were great. They were right! Most of the items on their menu are under $10; and with all the corn chips and salsa you can eat, it's a relatively inexpensive meal out. On the morning of the race, we drove over to the track about 11:00 AM to meet Lora, J. Michael, and their friends. The reason for going so early was to beat the pre-race traffic and to get a convenient parking space near the gate. The photo below was taken shortly after we arrived looking across the parking lot toward the vendor area. And this photo is the same area taken shortly before we went into the speedway at around 5:00 PM. You can see how much the crowds had grown. Keep in mind, this is only one of many parking lots. After we met up with the rest of the group around 11:00 AM, we chatted a while and had some snacks. There was shrimp dip, cowboy cookies, peanut butter cookies, and pepperoni roll. Then we walked down the hill to the vendor area. Many NASCAR fans are real die-hards and must have the latest NASCAR gear. T-shirts with their favorite driver's likeness and his car's number are a must. Hats and jackets are also popular. There are also mugs, posters, bumper stickers, and just about anything you can think of with driver numbers on them. Anytime a driver changes race teams and/or sponsors, the serious fan will go right out and buy new paraphernalia. Booth after booth stretching as far as the eye could see and the carnival atmosphere reminded us a little of Quartzsite, except that Quartzsite vendors sell mostly RV-related and general merchandise. The photo below shows just some of the many vendors. After walking around the vendor area, we headed back to where we had parked and lit the portable gas grills. Lora and Kathy worked to prepare our feast while J. Michael supervised. We dined on barbecued beef and pork ribs, cheesy potatoes on the grill, and a delicious salad. We got quite a few envious stares and comments from those passing by on their way to the speedway entrance. While most NASCAR Sprint Cup races are run Sunday afternoon, an increasing number of races like the one we went to in Charlotte are being run on Saturday night. Many fans seem to like the night races, probably because they can use Sunday to drive back home and don't have to take another day off work. We headed into the track around 5:00 PM in time for some of the pre-race festivities. There was a BMX bicycle stunt demonstration and a concert by Jessica Simpson. We had terrific seats fairly close to the track just before the start-finish line. Lowe's Motor Speedway is a mile and a half tri-oval, meaning the front stretch has a bend in it making the track somewhat D-shaped. The photo below is a panoramic shot of the track at dusk during the pre-race activities. Here is another pre-race photo with the Good Year blimp overhead. As it started to get dark, there were the driver introductions, the prayer, the National Anthem, and finally, the command, "GENTLEMEN, START YOUR ENGINES." Forty-three, 358 cubic inch, 800 horsepower, V-8 engines roared to life. What a thrill! The couple that couldn't attend the race were kind enough to loan us their scanner. The scanner can be programmed to receive the conversations between any or all the pit crews and their drivers. You can scan up and down your programmed list or select a specific team and listen in on their conversations to see what strategy they may be planning, how the car is handling, or when they are planning to come into the pits. You can also receive the radio broadcast of the race (which helps figure out what is really going on) or even listen in on the officials. The headsets that come with the scanner also help muffle the LOUD engine noise during the race. Paul deliberately took his headset off at the start of the race just to see what it would sound like. He thought the sound of forty-three engines firing to life was impressive, but it was nothing compared to forty-three, 800 horsepower engines all suddenly going to full throttle as the drivers all mashed down on the accelerator pedals simultaneously as the green flag fell. Because this was a night race, we didn't get many good pictures of the race itself because the cars were just going too fast in the low light conditions. But we did get a half-decent shot of the start of the race as the cars approached us on their way to the start/finish line, seconds before they all put the pedal to the metal. Attending our first NASCAR race was a great experience, especially sharing it with Lora, J. Michael, and their friends. With multiple cameras all around the track, in-car cameras, and instant replays, you can see more if you watch the race on TV. But there is nothing like being there live. You can smell the smells of oil and tires. We could even smell grass when someone spun out in the grass right in front of us. You can hear and feel the sounds - the roar of the engines vibrates in your chest. The race was won by Jeff Burton (#31). 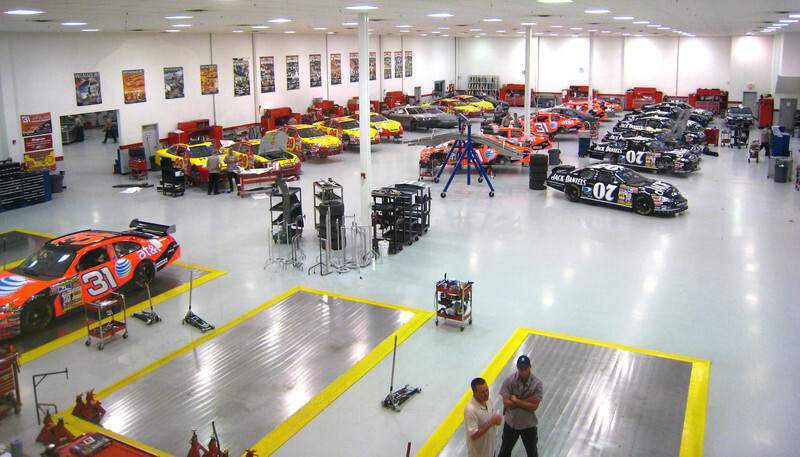 We had seen some of Jeff's cars being prepared last year when we visited Richard Childress Racing. With his win at Charlotte, Jeff moved up from fourth place into second in the championship chase only 69 points behind the leader, Jimmie Johnson (#48). After the race, traffic was at a standstill. Many of the 160,000 fans who attend the race end up crossing the road somewhere in the vicinity of the speedway to get to their cars. Of course, with all those people crossing the roads, the traffic that was already there ground to a halt. As soon as the fans got to their cars, they then all tried to get onto the roadways they just walked across. Our group, along with a few others, decided to just stay a while in the parking lot (even though it was late). We got out our chairs, had some leftover snacks and waited for the traffic to dissipate. It took about an hour and a half, but it was more pleasant sitting in the parking lot chatting and snacking instead of sitting in our car wishing we were moving. When we finally did leave, we easily got out onto the main road, waited for one or two traffic lights, and got back to the motor home in about 10 minutes. After a night's rest, we will be making a short, unexpected detour back to Pittsburgh. It's nothing serious, just a chance to test of our flexibility. We left Red Bay on a Wednesday and drove an hour and a half east to the Corinth Recreation Area located in the Bankhead National Forest. As we said in our last post, there wasn't much to do in Red Bay so we had plenty of time to drive out to Corinth one day to pick our site in advance. We probably wouldn't have needed reservations; but there were so few sites where we could get satellite, we went ahead and made them just to be sure. Corinth Recreation Area is located about 4 miles east of the small town of Double Springs and then about 3 miles south of U. S. Highway 278, so it is kind of in the middle of nowhere. (Zeller translation - the closest Wal-Mart is at least 25 miles away.) Consequently, the campground doesn't seem to be used much. That's unfortunate, because the campground is beautiful and is very well maintained. The couple that manages the campground is very conscientious. The grass was well manicured, the fire rings were all cleaned out, and the gravel at all the sites had been raked. Corinth has full hookups with 50 amp electric. Most of the campsites are well shaded, except for about a half a dozen sites on Firefly Loop, where we were located, that are a little more open with a clear view of the southern sky for satellite. Roads and pads in the campground are paved and the patios are gravel. The America the Beautiful Pass is honored at Corinth for half-price camping. The photo below shows our site at Corinth Recreation Area. The seclusion was refreshing after the close quarters and bustle of Red Bay. The recreation area is at the end of a county road, so there is no other traffic. We could hear birds during the day and crickets at night. There were no trains, no highways, and few other campers - except for the weekend when they were about 50% full. Even with all that seclusion, we still got 3 bars on our cell phone. Corinth will definitely be on our list of places we want to return to soon! We got the opportunity during our five-day stay at Corinth to sit outside to read and relax (there were very few bugs), to walk, and to ride our bikes. Right outside the entrance to the recreation area is the Corinth Baptist Church, which was built in 1884. Late one afternoon, we rode our bikes to the church. We just looked around the church and the adjacent cemetery and enjoyed the quiet. Last year, our travel route took us through Charlotte, NC, in October. 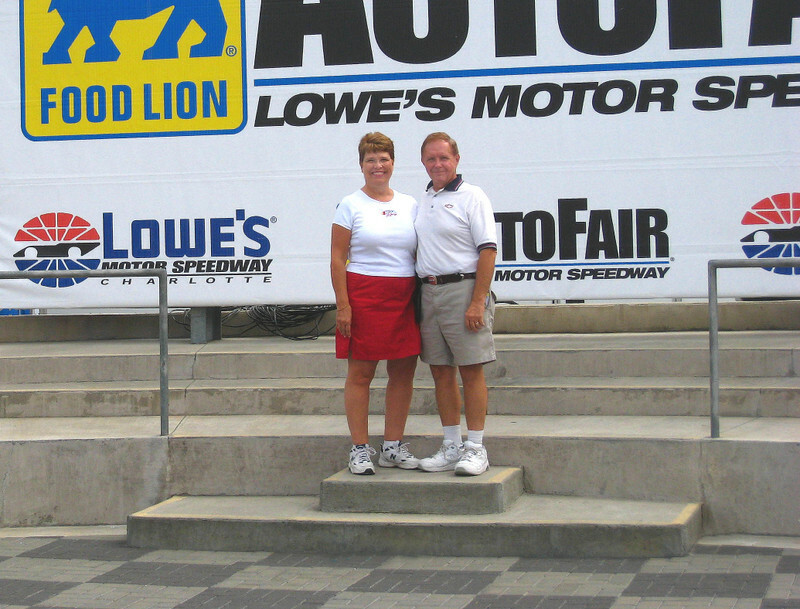 We were there the week before the fall NASCAR race at Lowe's Motor Speedway, and we toured the track as well as the shops of several race teams. Our daughter, Lora, and our son-in-law, J. Michael, have gone to the fall race in Charlotte with friends the last several years. This year, we got a call from Lora saying one of the couples who usually goes with them wouldn't be able to attend this year. Since Charlotte wouldn't be very far out of our way from our route to Myrtle Beach, they wanted to know if we were interested in the tickets. We had planned to meander over to the Escapees' Raccoon Valley Campground outside Knoxville, TN, until it was time to go to Myrtle Beach for our November 1 reservations. However, we jumped at the chance to go to the race instead, and immediately began researching places to stay. We found a county park with full hookups about an hour from the track just over the border in South Carolina, and we also found a reasonably-priced spot without electricity within sight of the speedway. The plan would be to go to the county park a week or so before the race, then move to the spot near the speedway for the night before and the night after the race. Since we usually don't like to drive more than four hours a day, we planned on stopping a couple of times between Corinth and the county park outside Charlotte. The first stop was Wills Creek RV Park in Fort Payne, AL. Wills Creek is an 18-month old campground that honors Passport America for a maximum of two nights during the week. They have full hookups with 50 amp electric, excellent satellite reception, gravel roads and pads, cable, and relatively widely-spaced sites with grass between. The owners are working hard to make sure the campground is in top shape. There are newly-planted trees, decorative lamp posts along the roads, and they are in the process of installing patios made from pre-cast concrete pavers. The campground is relatively quiet, but there is some distant noise from I-59. There are also some construction workers from a nearby highway project staying there who leave for work in their diesel pickups about 6:30 AM. The photo below shows our site at Wills Creek RV Park. One problem with our plan to go to the NASCAR race in Charlotte was with the availability of gas. Even though many of the refineries were back on line following Hurricane Ike, there were lingering distribution problems in the Southeast. A few weeks ago, we heard about gas lines in Nashville. Then it was Atlanta. Then, the spot shortages spread even farther, and many areas of the Southeast (particularly Georgia and western North Carolina - especially around Asheville and Charlotte) were reporting gas lines. Even though the pipeline that distributes gasoline to the Southeast had been repaired, shortages were expected to continue a little while longer. All the stations except Wal-Mart near the interstate exit in Fort Payne were out of gas. The Wal-Mart gas station was much too small and much too crowded for the motor home, so we had to pull into the campground with less gas than we would have liked, especially since we would be crossing the border the next day into Georgia where supplies were reportedly very low. After leaving Fort Payne, we passed many stations that had bags over the nozzles indicating they were out of gas, but there were also some stations with gas and without long lines. We were able to buy gas, albeit premium grade, in Summerville. The station we stopped at was out of regular unleaded; and all the other stations in the area, while they didn't exactly have lines, were too small and too crowded to get into with the motor home. The RV pumps at some of the Flying J stations were limiting purchases to 25 gallons, but gas was available. We are hoping things get back to normal in Charlotte before race weekend. Our next stop was Hartwell Lake Corps of Engineers Campground near Springfield, SC. Hartwell Lake is a typical, heavily-wooded, COE campground. But, since they have photos of each campsite online, we were able to pick an available site where we might get satellite. When we arrived it was early in the week, and we found the campground was almost empty. They told us in the office we could have any vacant site since we were only going to be there one night; however, we were pleased to find the site we had already picked was fine for satellite. Because it was also a pull-through, we didn't have to unhook the toad for a one-night stop. The photo below shows our site at Hartwell Lake COE. The water level in the lake was way down due to the ongoing drought in the Southeast. The online photo showed the site we picked was a waterfront site; but when we got there, the inlet behind the site was totally dry. Judging from the size of some of the saplings where there used to be water, the water level has been down for some time. The photo below shows what's left of the inlet behind our site. At Hartwell Lake, we got to enjoy another afternoon and evening of seclusion. We walked almost the entire campground, which felt good after sitting and riding in the motor home for several hours on each of the past two days. The next morning, we left for Ebenezer Park, which is where we planned to stay for a little over week until we are ready to head to Charlotte for the race. Ebenezer Park is owned and operated by York County near Rock Hill, SC, and is about an hour from Lowe's Motor Speedway just north of Charlotte. Ebenezer is first-come, first-served so there are no reservations and no saving of sites. The locals have figured out a way around the no reservation policy by using tents to hold their favorite sites, so the best lake-view sites seem to be hard to get. There is a sign that says "NO SAVING SITES"; but, the ranger turns a "blind eye" while the locals use tents to hold sites for themselves or for their friends who might be arriving later. Even though we arrived in the middle of the week and fairly early in the day, there weren't many sites left. Most of the available sites were in the one section of the campground that was heavily wooded. There was one available site, however, with a partial lake view. It looked like the tree on the back of the site might block our satellite dish, but we backed in anyway before someone else came along and snatched up the site. We sent the dish up to search for the satellite; and to our surprise, the dish found a signal! One of the reasons the campground at Ebenezer Park is so popular is the price. Their regular rate is $15 a night, but they only charge $10 for anyone over 60 years old. Ebenezer Park campground has gravel roads and pads. Most of the sites are fairly widely-spaced with grass between, except for the sites in the heavily-wooded section which have little or no grass. The sites all have full hookups, there is free Wi-Fi, and many of the sites have 50 amp electric. We don't know about the other 50 amp sites, but ours had 50 and 20 amp only. There was no 30 amp plug, which might be an inconvenience for some people with a smaller rig. The lack of a 30 amp plug, plus the fact the site is very close to the one to our right, may be the reason the site was still open and hadn't been saved by one of the locals. The photo below shows our site at Ebenezer Park. The park is located on Lake Wylie which has a surface area of 21 square miles and a 325-mile shore line. The lake extends well up into North Carolina. 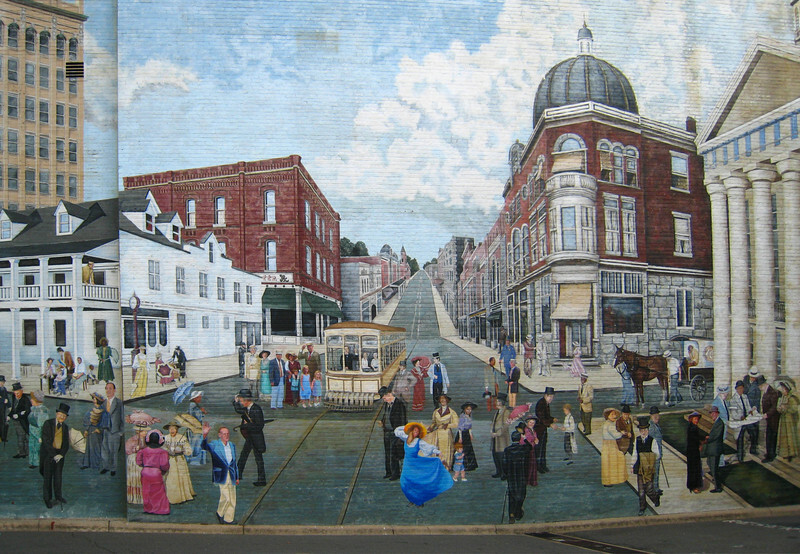 The Catawba River was dammed in 1904 in order to build a hydro-electric power plant. Today, Wylie Steam Power Station is located on the northern part of the lake and Catawba Nuclear Power Station is located on the southern part of the lake a short distance from Ebenezer Park. Because of the power plants, the water in the lake must be maintained at a relatively high level in spite of the drought. In addition to the campground, Ebenezer Park has a day use area, which is shown in the photo below. There are also boat-launch ramps out of the photo to the left. From the dock by the boat launch, you can get a beautiful view of the sunset over the lake. One day we headed to Matthews, NC, to visit with friends whom we had met in Davenport, IA, while we were waiting for the flood waters to subside this past June. Although they travel extensively throughout the year, they fly home every 3-4 months to see family. Our timing was just right to re-connect. We enjoyed a barbecue lunch at Mac's Speed Shop and especially appreciated eating in the outdoor dining area on a mid-70's afternoon. The pulled pork sandwiches were delish and their onion rings outstanding. On our way back to the house, our friends wanted to show us Calvary Church, an evangelical, non-denominational church that is stunning in its architecture, envisioned as a modern day cathedral. This photo was shooting into the sun, but it gives you an idea. It is home to one of the largest pipe organs in the world. The blue shadows between the windows and the large panel in the back of the platform are some of the 11,499 pipes. Notice the cross on the ceiling. The sanctuary seats over 5,000 and has two balconies. We have yet to visit the Crystal Cathedral. Until then, this is the most beautiful modern cathedral we've seen. The photo below shows the entrance to the lobby. It was great re-connecting with friends, and we look forward to seeing them "down the road." We will stay at Ebenezer until heading into Charlotte for the race. There is plenty of time for us to chill out. During our stay at Ebenezer Park, we will catch up on some shopping now that we're in a metro area with our favorite chain stores. Margery will be trying to pick a beauty shop for a haircut (always a challenge), we'll have our mail forwarded, and we'll need to restock our pantry. We will be tailgating in the parking lot on race day; and since the other couples with whom we will be attending the race will be staying in a motel, we're going cook ribs for the tailgate party.